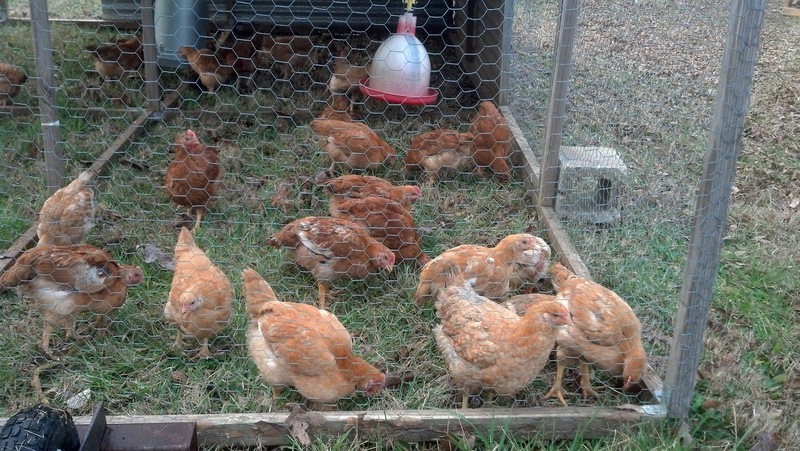 K and H Farms: Chickens A-Growing!! Well, even with the cool weather, the broilers are growing, growing, and growing. They are loving being on the grass and having enough roam to move around. They have been doing great even with the cold weather. We held them in the brooder a little longer than usual just because we didn't want to loose any to the cold wind. Since they have shelter from the strong winds, they are able to huddle and keep each other nice and cozy! We found out by loosing quite a few last year just how important it is to protect them from the strongest winds. They are really bad to smother each other to keep warm. We add some shredded paper just for some added warmth too. These steps have really helped to keep all of them healthy and growing! We are hoping at the rate these chicks are growing that we'll still be able to make our first pick up date. Since we lost most of the first batch and had to start over, we are a week behind with our first batch. We may still have to push them back to the next week. With farming, you sometimes just have to go with the flow and that's what we're doing here. We do our best and work with what God lays out before us.